Several months after releasing the Vivo 5 and Vivo XL, BLU this week introduced two new Android handsets called Dash X2 and Dash M2. Both devices cost less than $100 unlocked, and offer something that you don't get at this price point (at least not in the US): metal bodies. While BLU assures us that the Dash X2 and M2 are made out of aluminum, we don't know if they have all-metal bodies (the front panels look like they might have some plastic in them). In any case, it's the first time that we're seeing metal-made smartphones being released in the US for under $100. More exactly, the Dash X2 costs $84.90, while the Dash M2 is priced at $69.90. 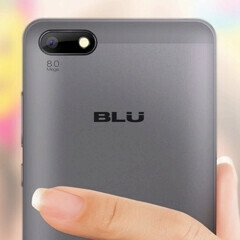 The BLU Dash X2 and Dash M2 are powered by the same quad-core MediaTek MT6580 processor clocked at 1.3 GHz, and sport 5-inch screens (720 x 1280 pixels on the X2, and only 480 x 854 pixels on the M2). The Dash X2 features an 8 MP rear camera, 2 MP front-facing camera, 8 GB of expandable internal memory, and 1 GB of RAM. The Dash M2 offers a 5 MP rear camera, a 2 MP front-facing shooter, 512 MB of RAM, and a partly 4GB of storage space, which probably leaves almost no room for apps - luckily, you can add a microSD card to make the device usable. Both new BLU smartphones run Android 6.0 Marshmallow out of the box, and unfortunately don't have LTE connectivity. But they come with dual SIM support, and will work on AT&T, T-Mobile, or any other GSM carrier. The handsets can be ordered via Amazon - see the source links below. Interested? What a waste of cheap metal... At least put a 16GB storage and a 2GB RAM for another 20 bucks. why bother make 2 different phone that only $15 apart? In 2016 making a phone with less than 2GB of RAM and with only 8GB of internal storage shouldn't even be a thought for OEMs. I understand they are targeting people with a tight budgets, but making something like this that would give these people a bad experience about Android is crazy.